Bloomberg reports that the administration could announce the levies by early December, to take effect by early February. (The plan is said to be a backup, in case a meeting next month between President Trump and President Xi Jinping of China doesnât yield results.) 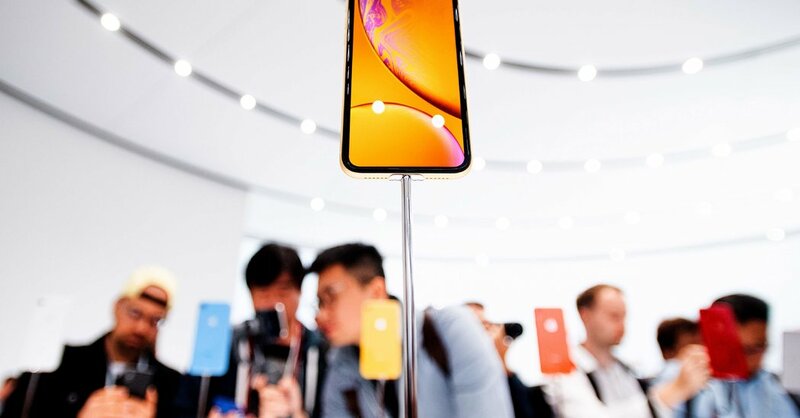 The tariffs could cover about $257 billion worth of goods â including popular items like iPhones and Nike sneakers. The Trump administration made another move to check Beijingâs tech ambitions: It blocked Fujian Jinhua Integrated Circuit, a semiconductor maker, from buying U.S. parts, citing national security concerns. The decision, which came after the American chip maker Micron accused Jinhua of intellectual property theft, could be a crippling blow to the Chinese company. (And it drew comparisons to the Trump administrationâs harsh actions against ZTE earlier this year.) The penalties will delay Chinaâs effort to establish a homegrown chip industry that doesnât rely on American parts. Experts said that the move sets an aggressive new precedent over how America responds to alleged I.P. theft. Whatâs unclear is whether it will spur Washington and Beijing to use national security concerns more frequently as weapons in their trade fight. The S.&P. 500 swung wildly yesterday, moving as much as 4 percent from high to low before ending the day down 0.7 percent. (Itâs now just shy of correction territory.) The Dow and Nasdaq fared similarly. A positive take: Stocks havenât looked this cheap since 2016. Wall Street will watch Facebookâs third-quarter financials. Investors will be looking for declines in user numbers and ad sales after a series of scandals affected the social network. The E.U. reports on economic growth. Official figures are expected to show slower growth in the eurozone. But Mario Draghi, the president of the European Central Bank, said last week that while the regionâs economy is growing more slowly, it is not sinking into recession. Robert Bowers, the suspect in the Pittsburgh rampage, posted reams of hateful messages online. But an investigation by the NYT found a torrent of anti-Semitic content that had been uploaded to Instagram since Saturdayâs shooting â 11,696 posts with the hashtag â#jewsdid911,â claiming that Jews had orchestrated the Sept. 11 terrorist attacks. Over the last 10 years, Silicon Valleyâs social media companies have expanded their reach and influence to the furthest corners of the world. But it has become glaringly apparent that the companies never quite understood the negative consequences of that influence nor what to do about it â and that they cannot put the genie back in the bottle. The chancellor of the Exchequer, Philip Hammond, announced the initiative as part of the nationâs annual budget. The new charge, scheduled to go into effect in 2020, would apply only to organizations with global revenue of at least 500 million pounds, or about $640 million. The government will ask for 2 percent of revenue the companies generate in Britain. Mr. Hammond said the plan could eventually raise as much as Â£400 million annually. More British budget news: Hereâs a roundup of the countryâs other plans. Ms. Merkelâs retreat, analysts say, could mark the beginning of a new era not just for Europeâs biggest country but for the Continent itself. It could leave Germany more unstable and less able to take the lead in Europe at a time when leadership is badly needed on an array of topics â from Britainâs imminent departure from the European Union to Italyâs controversial budget plans. Campbell Soup decided to âaccelerateâ the retirement of Kelly Johnston, an executive who tweeted about a conspiracy theory involving George Soros. The scooter company Lime hired David Richter, Uberâs former business chief, to oversee M.&A. and sales strategy. Kristen OâHara was named Snapâs chief business officer â only for the companyâs C.E.O., Evan Spiegel, to change his mind two days later. She has now left the company. â¢ Ginni Rometty has bet her legacy as IBMâs chief on the companyâs biggest-ever takeover, the $34 billion acquisition of Red Hat. Analysts think Workday and Okta could be the next cloud software companies to be bought. â¢ President Trumpâs job approval rating fell last week after the pipe-bomb mailings and the Pittsburgh attack. Aides conceded that he is having a hard time balancing midterm campaigning with public empathy. â¢ The renminbi hit a decade low, but the Chinese central bank might not be doing the right things to save the currency. Thanks for reading! Weâll see you tomorrow. Weâd love your feedback. Please email thoughts and suggestions to bizday@nytimes.com.